I have never been on more intimate terms with beef than today. I was chopping beef for 45 minutes. That is a long time beef chopping. As I am a good student, I read all the Dave-suggested reading and more. The start was reading a lot about the cuts of meat I should use. It took me a while to decide but finally I decided to go for the ratio of sirloin, brisket and oxtail as suggested here. Off I went, happy to have had a decision made for me, to the local butchers ‘Provenance‘ with my grams written down. I got there and the very helpful fellow was sad that he didn’t have the particular cuts in stock. Well, shucks, that meant I had to make my own decision aided by research, a fellow shopper and the butcher himself. 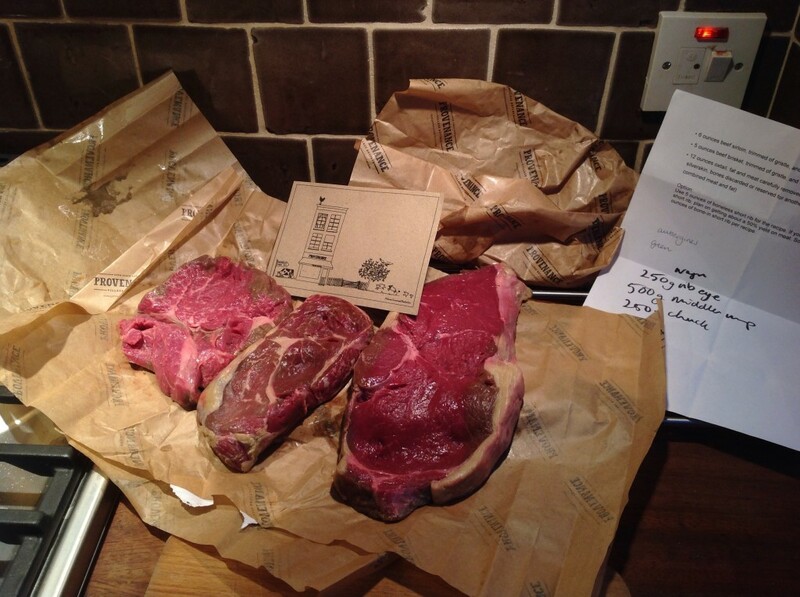 We ended up going for 50% rump steak, 25% rib eye and 25% chuck. Rump for binding quality, chuck for binding and texture and rib eye for extra fat and flavour. It might sound stupid, but I first read a ‘how to chop’ post and just as well that I did. I usually leave meat out of the fridge for a few hours before I cook it, and had taken the meat out whilst making breakfast before sitting down to have a read. Then the chopping post says to leave the meat in the fridge so it’s cold when you chop it. That totally makes sense as when cold it has a more solid texture. So I quickly returned it to the fridge for a while before chopping time. 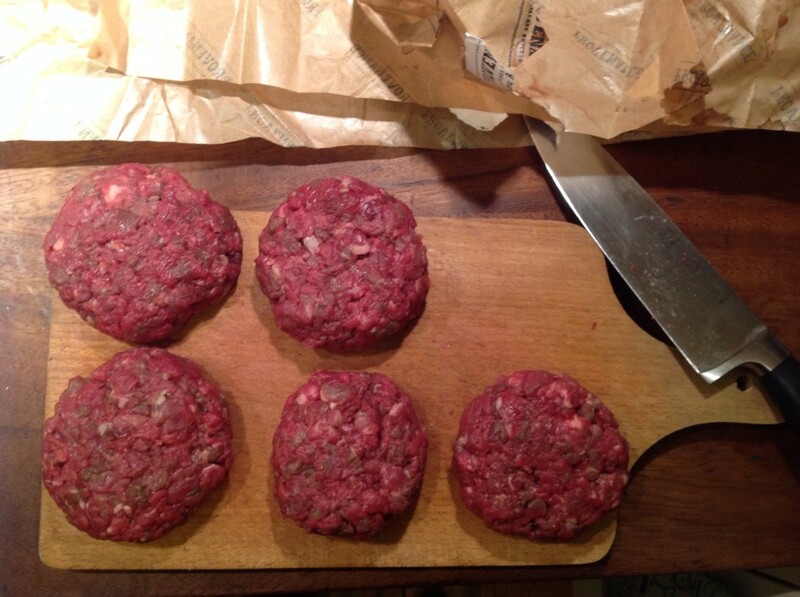 Having only made a burger before using pre-ground beef, egg to bind, breadcrumbs and flavours (maybe herbs, maybe something more exciting too) I was a little nervous that the meat wouldn’t stick together well. As per the challenge post, I was under strict instructions that the burger should be 100% beef therefore I couldn’t chuck anything else in. 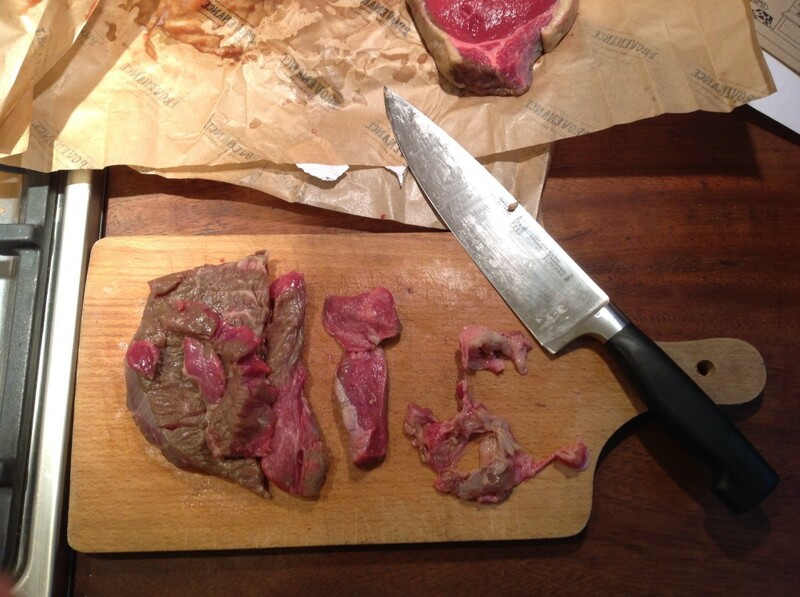 Also reading the ‘salting your meat’ blog post was very useful – have a look at the difference in texture simply caused by when you salt your meat! I started by working on each different cut one by one. Using a big sharp knife (thanks to The Jim for sharpening it) on a wooden chopping board, first I cut the meat into palm size pieces then into fingers, then into smaller and smaller pieces. I spent about 4 minutes chopping per 100 grams of meat. I took out the fat and sinewy bits very carefully (Henry’s dog will be enjoying them for dinner). It was interesting to work so closely with the different cuts as I haven’t ever really paid an awful lot of attention to the different sorts of fat and texture of each. 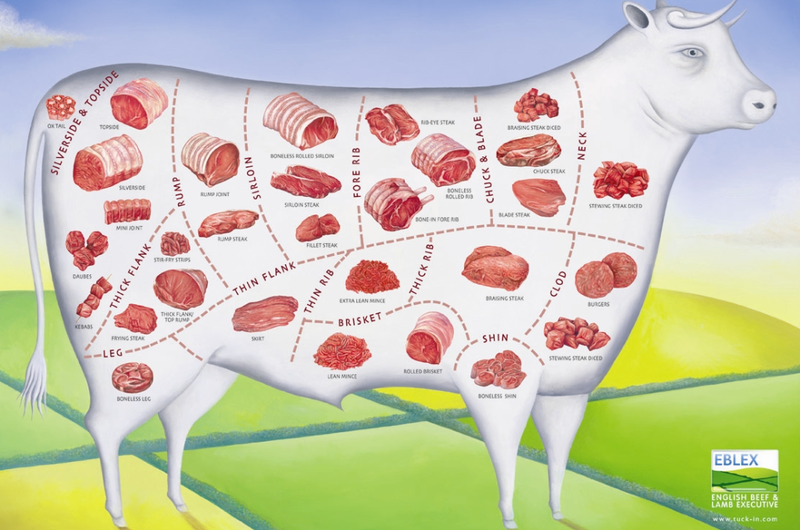 Once I had dealt with each cut I then squashed all the meat together with my hands then took it out of a bowl a handful at a time and chopped it all together, still wondering if the mixture would stick together. 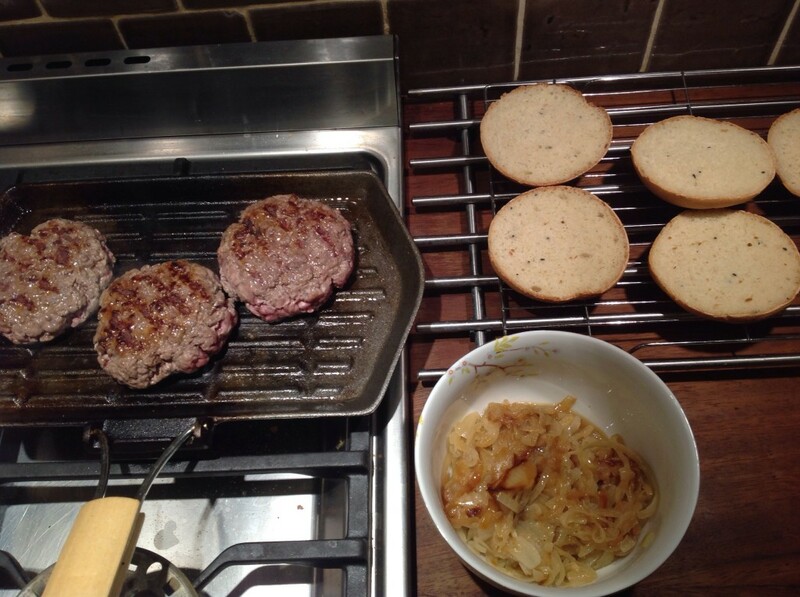 I got to the point of shaping the burgers and thankfully it made great patties. Starting with a kilo of meat and I ended up with five patties (yay for more burgers one night this week!). I then wrapped them in parchment and popped them in the fridge for a bit hoping it would help them stay together more. Then I dug out the heaviest griddle pan we have, wiped it with vegetable oil and let it get very hot. 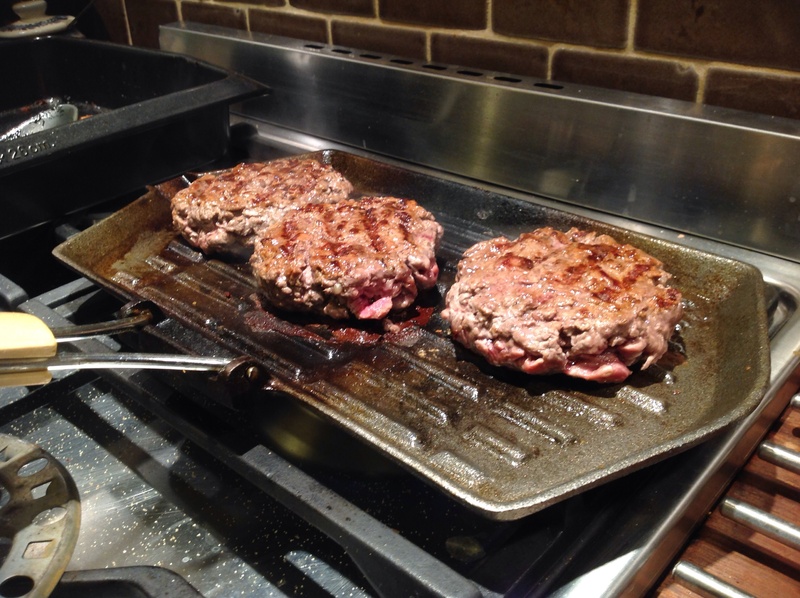 Out came the burgers, salted at the last moment, and when they hit the pan they sizzled away perfectly. I cooked them for about four minutes each side (I made them quite thick – personal preference) and they were still nicely gruesome inside but browned on the outside. And there we are. 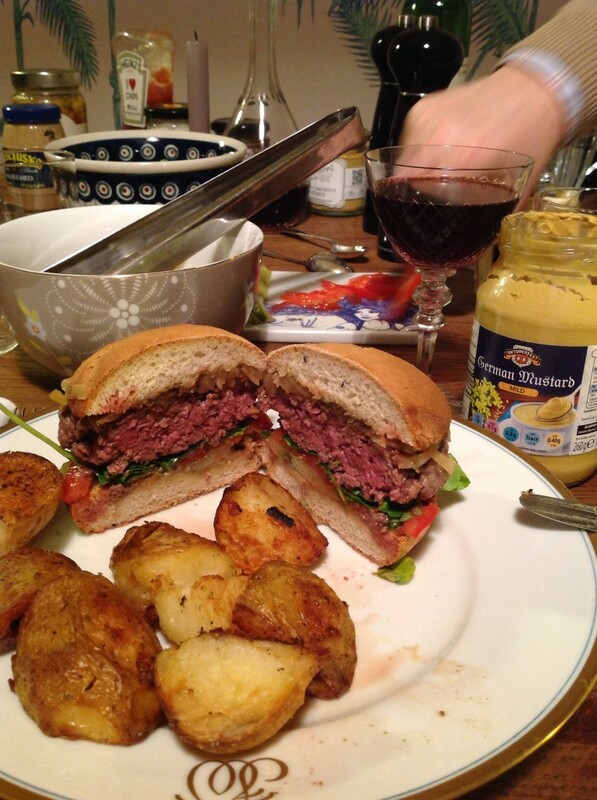 All in all, a great burger, though I would use a slightly fattier meat or perhaps a longer aged beef if I cook them again. Henry (has a farming background so knows his meat) enjoyed it and I don’t think I could get a better approval. He doesn’t “mince” his words so I don’t think he was just being polite! Jim made delicious camarelised, fried onions to have as an accompaniment, and crispy, roasted new potatoes. Then we had an array of condiments and pickles. I had a lazy German mustard, onions, gherkin, thin sliced tomatoes and some cress. P.s. I also made the buns which were simple white rolls with a few nigella seeds chucked in. Plus they were quite small – I am a huge believer in the bread only being the vessel for the meat, that it should, in no way overpower the main event (meat, in this case). Anya, those burgers look fabulous! Plump and juicy – they’re look to be spot on. I hope it was worth all the chopping. I am now craving beef burgers. I may well have to make some of my own again soon. They look very good although possibly a little gruesome for me. But they do look good.